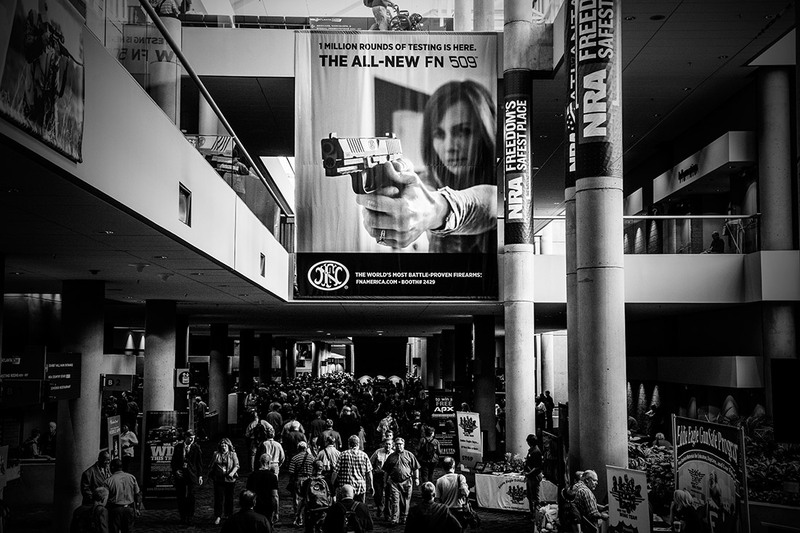 They’re here in Atlanta for the NRA’s annual convention, a Second Amendment forum wrapped in a stunning, sprawling gun show. The President of the United States is here. For the first time in eight years, the NRA has an avowed advocate in the White House. The optimism is palpable, but around every booth and billboard there are indicators that the organization is still poised for a fight — an opposition party even now, with a friend in the highest place. Thousands attended the convention at the Georgia World Congress Center. Those who aren’t familiar with these types of events may be surprised to know that they are, on an almost organic level, a family affair. 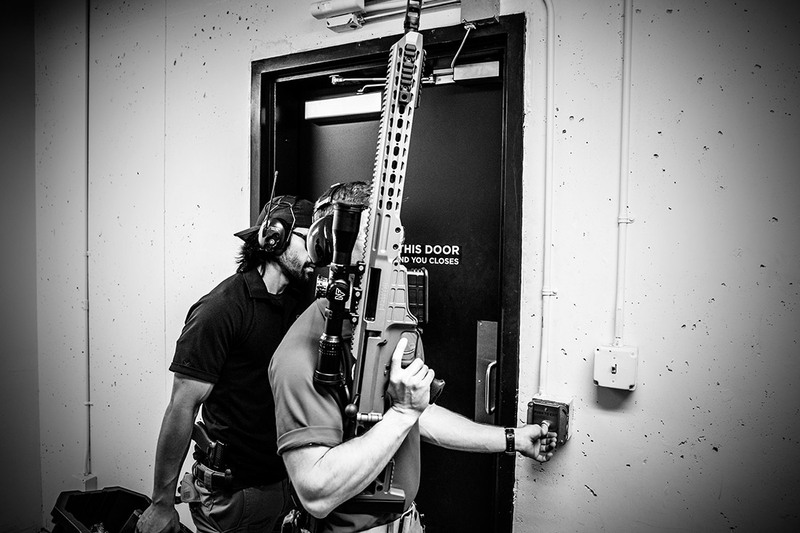 There are a fair number of strollers on the floor, and young children toddling hand-in-hand with their mothers and fathers among booth after booth of firearms, ammunition, knives and outdoor gear. In context, in the moment, it doesn’t seem out of place at all. To gun advocates, the seemingly endless parade of pistols, semiautomatic shotguns, rifles and revolvers represent safety, not violence; responsibility, not recklessness. 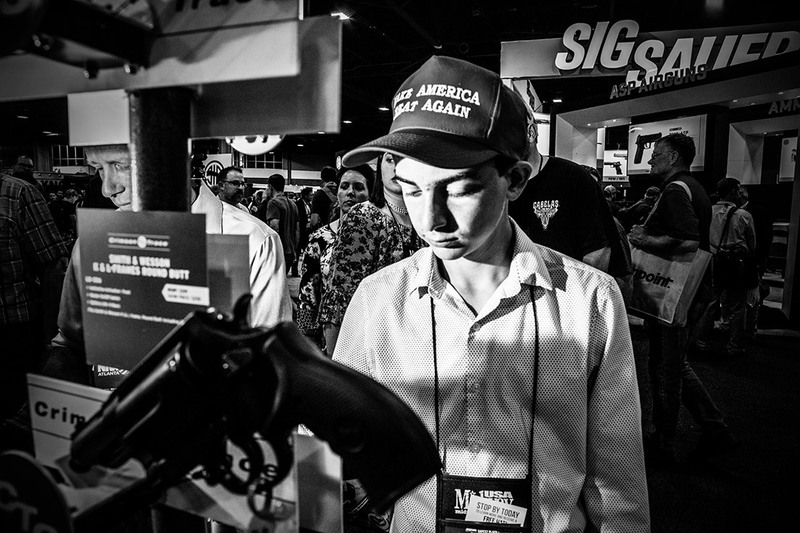 Noah Lynn, a 14-year-old from Dunwoody, Georgia, looks at handguns on the convention floor. Seth Lynn is here with his 14-year-old son, Noah. Noah is wearing a red “Make America Great Again” hat and has bright socks with cartoon Trump faces. Lynn took him out of school for this event, and he says it was worth it. Noah doesn’t have a gun yet. Lynn says it will take time. He’ll decide when his son is mature enough to own one. 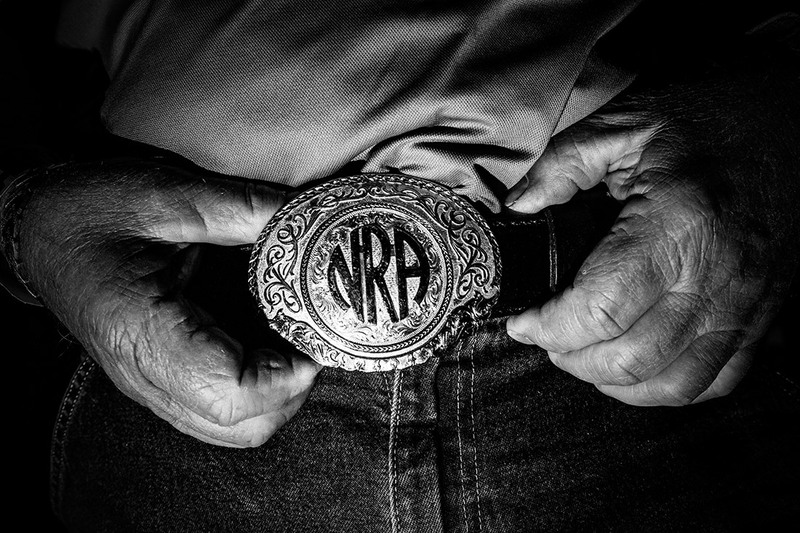 A man shows off his NRA belt buckle. There is, without a doubt, no way to describe the typical NRA member. White, you may think. Probably older. Those demographics are certainly overrepresented at this year’s convention, but according to NRA data, 40% of their approximately 5 million members are minorities. Then, there are the more practical, overlapping factions: The hunters, the sportsmen, the collectors, the staunch Second Amendment protectors, the ones who prioritize self-defense. At this meeting, there are those who are here for Trump and think guns are just OK, and others who think Trump is just OK and are here for the guns. Then there’s Maj Toure. His T-shirt will stop you in your tracks, and that’s exactly what he wants. 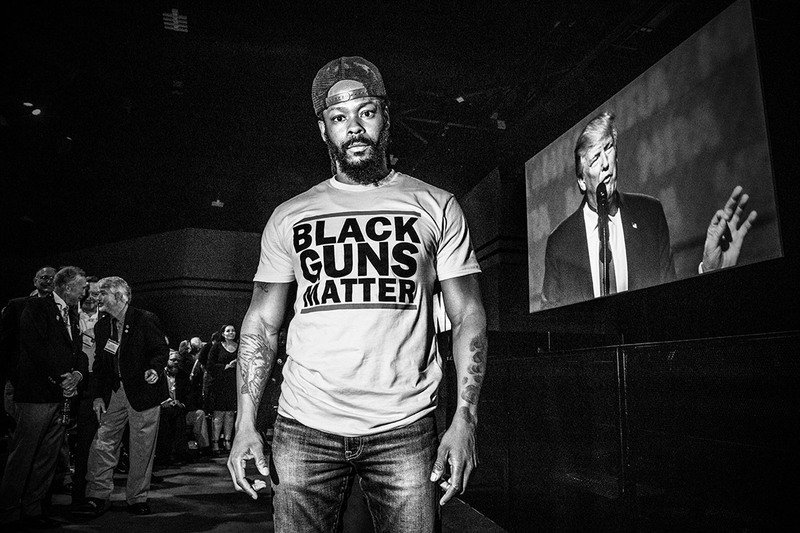 Toure is the founder of Black Guns Matter, a firearms safety and training organization that focuses on urban areas. He is a member of the NRA. He is also a familiar face here; he has appeared on several of the organization’s platforms, including NRATV. Maj Toure is the founder of Black Guns Matter, a firearms safety and training organization. 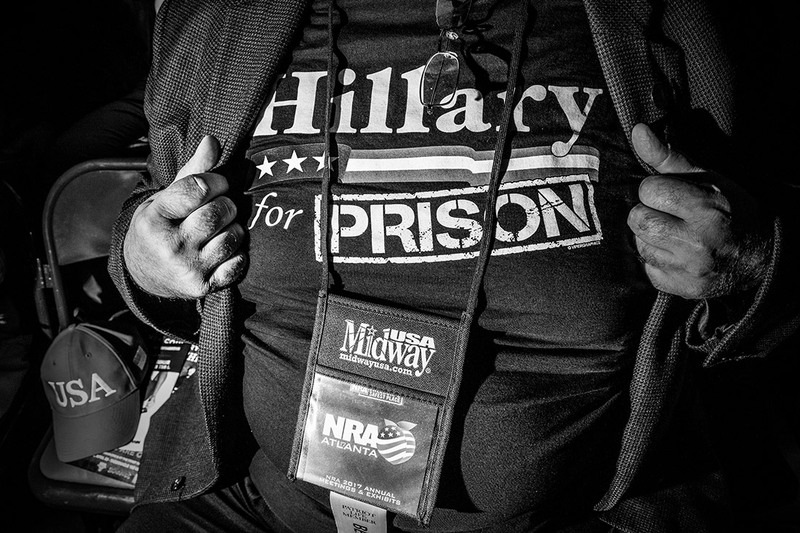 Hillary Clinton was not a popular figure at this year’s NRA convention in Atlanta. The main event is, of course, President Trump’s keynote address on Friday afternoon. According to the NRA, 10,000 people purchased tickets to hear him speak. The conference is held in an artfully lit space in the bowels of the Georgia World Congress Center. Those lucky enough to score the front-most seats got in line as early as 6:30 a.m., six hours before the program was slated to start. Here, as everywhere at the convention, there is a colorful array of conservative, Second Amendment-flavored apparel. Anti-Hillary Clinton slogans have apparently enjoyed a healthy post-election holdover. 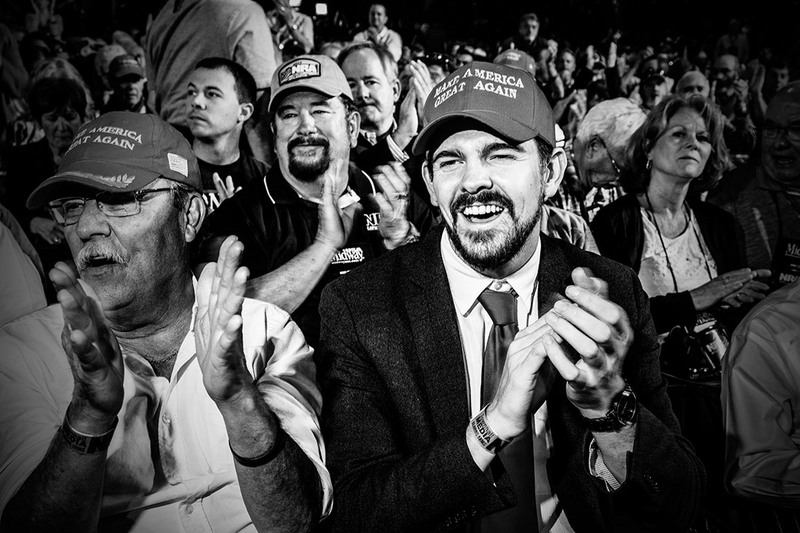 People attend a leadership forum where President Trump was delivering the keynote address. The program starts late, but no one seems too perturbed. To pass the time, NRA-produced videos show on big screens up front. Before Trump, LaPierre and NRA Executive Director Chris Cox speak. Cox gets the biggest laugh of the day when he describes a conversation he had with Trump about the size of his inauguration crowd. In such a way, their rhetoric cycles through a familiar roster of NRA heroes and villains. The biggest boos are, naturally, for Clinton and former President Barack Obama. The biggest cheers are for former President Ronald Reagan and, when he finally takes the stage, the man they’ve all been waiting for. 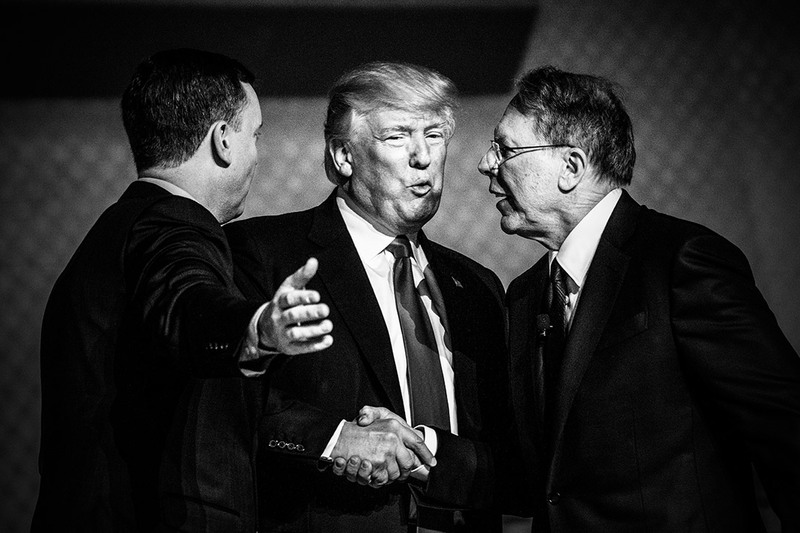 Trump shakes hands with NRA Executive Vice President Wayne LaPierre at the convention. On the left is NRA Executive Director Chris Cox. “You have a true friend and champion in the White House,” Trump said in his speech. The President is in his element. He lavishes praise and promise on his favorite kind of crowd: The one that loves him. A chant of “build the wall” and another of “USA” form and swell as Trump goes through familiar talking points. 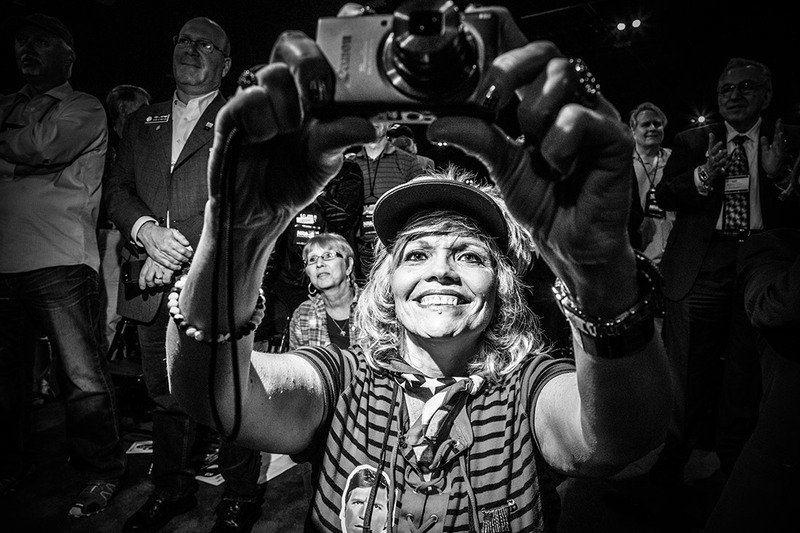 A woman takes a photo at the NRA leadership forum. There’s not a lot of specifics on gun rights, but he does touch on some greatest hits: Illegal immigration, his Cabinet and of course, as he calls it, that great night in November. When he’s done, he doesn’t rush to leave the stage. He lingers, opening his arms, feeling the love. US Rep. John Lewis speaks at an event in Atlanta organized by Everytown for Gun Safety, a gun-violence prevention group. It took place about a mile from the convention. On Saturday morning, about a mile from the convention, a group of about 100 protesters has gathered in Atlanta’s Woodruff Park. 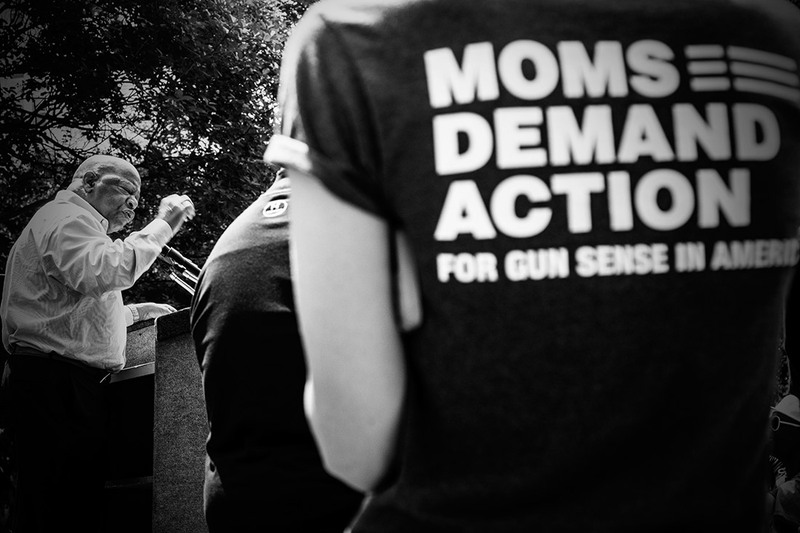 The demonstration is organized by Everytown for Gun Safety, a gun-violence prevention group that was started after the Newtown, Connecticut, school shootings in 2012. The crowd is a tiny fraction of the tens of thousands of convention attendees, but it is vocal. It includes Georgia Congressman John Lewis and Ashley Cech, the daughter of a Newtown survivor. Cech’s mother, Yvonne, was a librarian at Sandy Hook Elementary when the shootings happened five years ago. While a gunman roamed the halls, she piled 18 fourth-graders into a closet and told them to stay quiet like it was a game. They all survived. 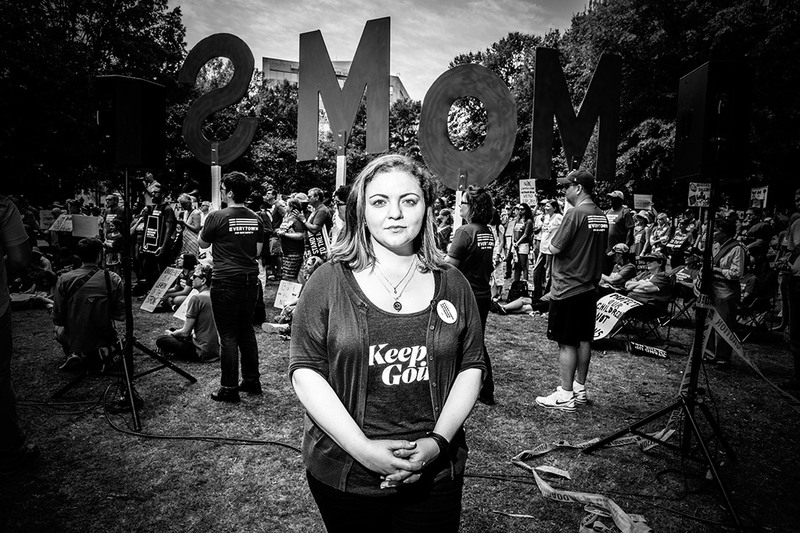 Ashley Cech’s mother survived the 2012 school shootings in Newtown, Connecticut. Ever since, the younger Cech has been working to find solutions. She thinks curbing gun violence is a compromise, not a takeover. “I knew there had to be a way to improve gun laws and still be able to respect the Second Amendment,” she says. “I don’t accept that there is no way these two things can coexist.” She says plenty of gun owners are involved in their outreach. 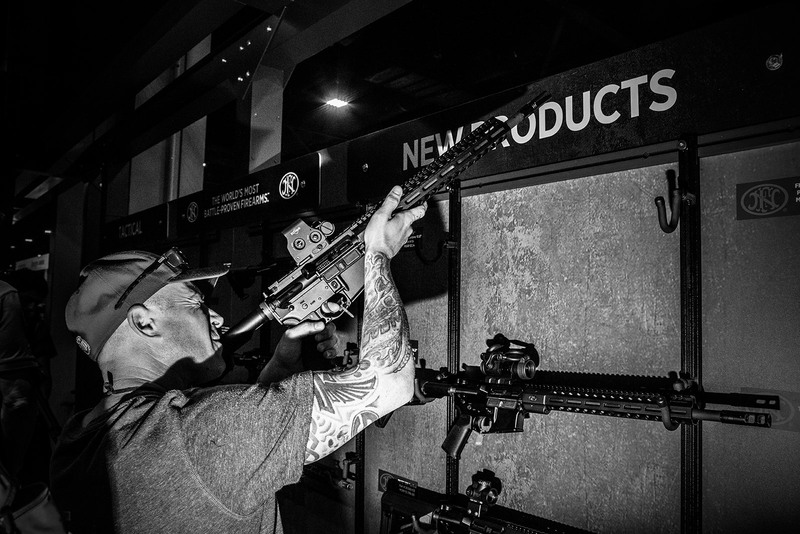 Stoddard’s Range and Guns hosted convention attendees in Atlanta. The slogan “freedom’s safest place” follows you everywhere around the convention. It’s an obvious allusion to the Second Amendment, the freedom LaPierre likes to say protects all other freedoms. The inference, of course, is that outside of these walls, such a freedom is no longer safe. The NRA is in good with the current administration. They are intertwined — financially, ideologically. And yet, the NRA is still fighting. It’s hard to put a finger on it. Walking through the convention, one gets the sense that the people here are being told they are surrounded by enemies — Islamic terrorists that want to ruin their way of life, untrustworthy elites who want to poison their minds and take their guns, leftist groups who want to demonize their passion and scrub the Second Amendment right off the Constitution. The next crisis is always around the corner, and the gun owners of America, fresh off the heels of a momentous victory, could be struck down again at any turn. It’s like the NRA is painting itself as David with a rock in hand, when in reality, bolstered by an entire administration, a sympathetic Supreme Court, hundreds of millions of dollars of annual revenue and the loyalty of five million members, it appears more like Goliath with an AR-15. 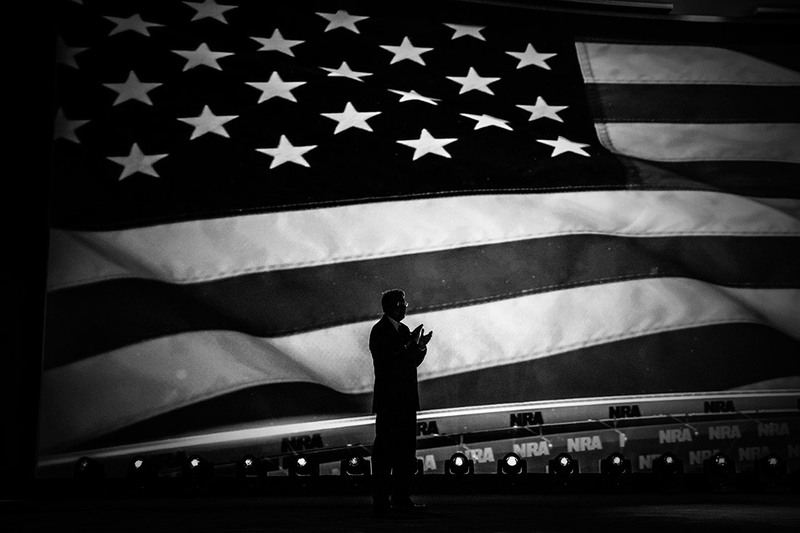 NRA Executive Vice President Wayne LaPierre applauds during the convention. But there is also a more fundamental fight. One side says a gun is violence — a killing thing. But the other side says a gun can be peace, too — a comforting thing. You can sense the frustration in those who just wish the other side would understand. “A gun saved my life,” the advocate says. “A gun killed my child,” the protester responds. It’s a stalemate with no clear solution. Mark Peterson is a New York-based photographer represented by Redux Pictures. His latest book, "Political Theatre," looks back at the 2016 presidential campaign. Follow him on Facebook, Instagram and Twitter.